It’s Friday, 31st August – and that means it’s time to review how Tau Station has been improved this month! 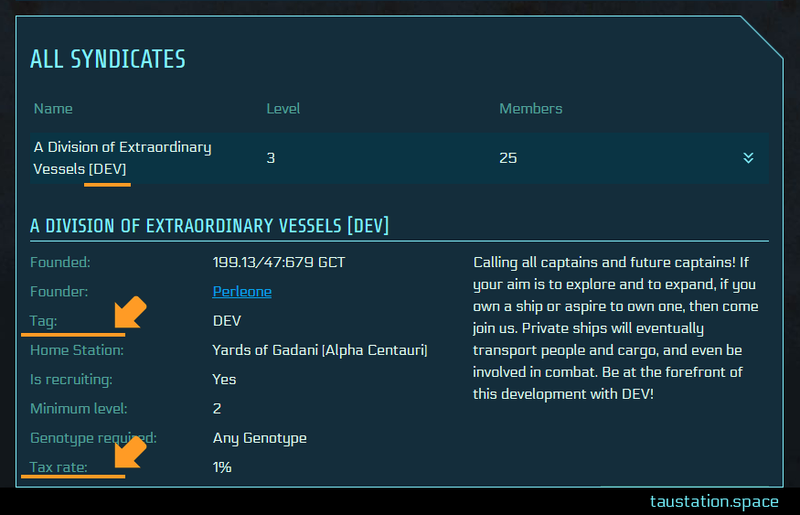 Among other things, many new courses are available for private ship Captains, Syndicates are improved, a new mission can be played, Discreet Work has received various updates, and more. Read on for full details and to learn what is planned for September 2018! Many new University courses are available to boost the efficiency of your private ships. 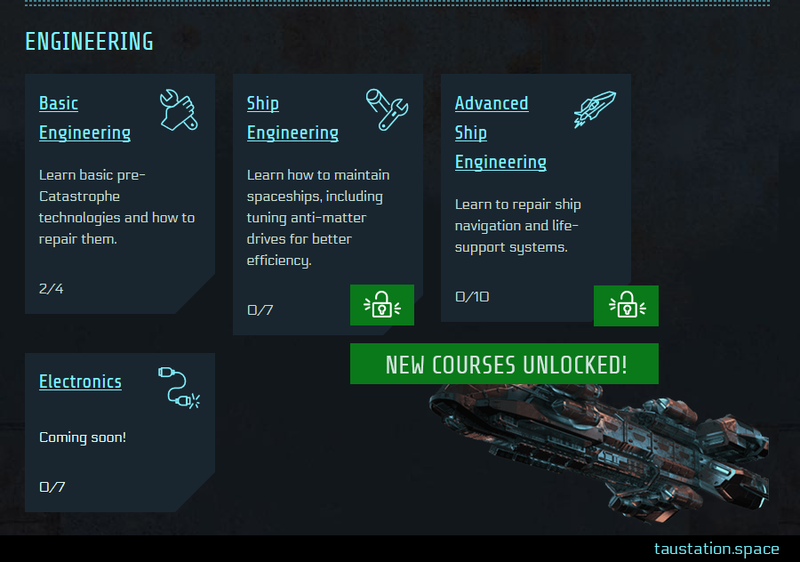 Ship Engineering (7x) – Unlock various benefits with 7 new courses. Captains can reduce their ship’s fuel consumption and chances of taking damage. Jump Gate Navigation- A new course is available, decreasing jump gate travel time. New Mission “Fun Gus Among Us” (level 7) on Moissan station in Alpha Centauri system. Discreet Work – Various changes have been implemented. The entire flow from start to finish has been improved, e.g. you no longer lose the back-link! There are more items now, plastic scrolls have been reduced; empty descriptions and missing item weights have been fixed. Foundation – At the Gov’t Center you can now see local licence applications, but also those on other stations. Several optional actions have also been added. Roles – New roles have been added to the rights management, more will come (officers). Tags – A membership is now indicated by showing the tag in chat and on profile pages. Taxes – Syndicates can modify their tax rate. The percentage is shown in the detail view of each syndicate (CORETECHS list). Traveling – Important syndicate actions can now be performed while traveling or engaged in another activity (e.g. membership decisions, toggle recruiting, etc.). XP – Alliances now gain experience for each character action rather than the amount of character experience gained. You now benefit from every member’s activity, no matter which level they have. Bank (Order) – Switched sections, so withdraw/deposit credits comes first. Chat (Performance) – The chat is faster now and some additional fixes are in place. Forums (Buttons) – Re-Positioning: “reply” is now the most prominent button on the right. Help (Toolbar) – A new information icon has been added to the upper left toolbar. It contains some advice and hints for new citizens, links to helpful fan sites, but also information like how to get in touch with our support. Inventory (Dropping) – As requested, we added a confirmation dialogue for dropping items to avoid accidental losses by clicking the wrong button. Multi-Stims (Stacks) – The stim packs boosting more than one stat are now stackable. Public Market (Armor) – Correct stats are now shown in detail view instead of zero. Sidebar (Areas) – The areas are now sorted correctly in alphabetical order. Staff (Chat) – Official Tau Station team members are indicated with the new [staff] tag. 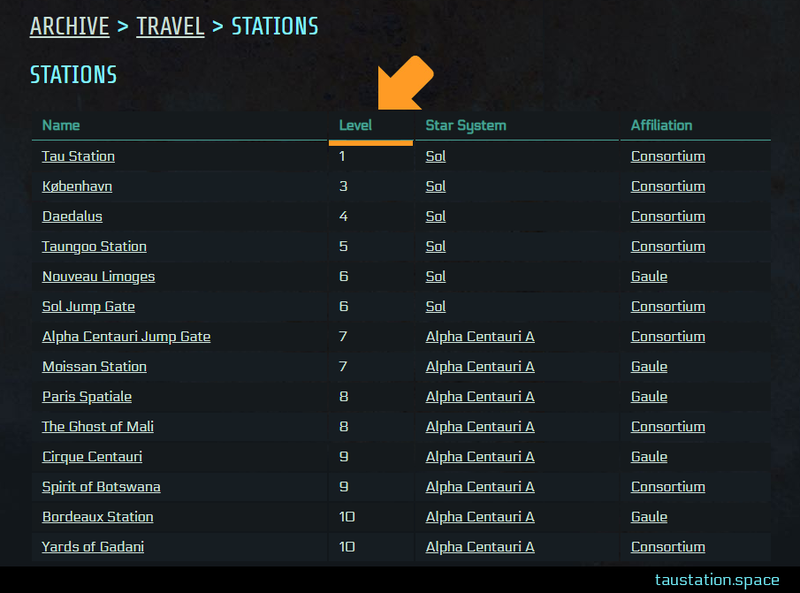 Stations (Levels) – At the request of Tau Station citizens, the archive station list now shows the station levels. Typos – Several typos have been fixed; thanks for all your reports! New System – Barnard’s Star. Missions – New story missions. Missions – Showing rewards at the end. Syndicate – Special campaigns for your alliance. Avatars – Chose a picture for your alter ego (if enough time left). The new help icon grants quick access to some basic help and even to several useful fan sites. Many courses of “Ship Engineering” and “Advanced Ship Engineering” have been unlocked. This way, owners of private ships can boost the efficiency of their vessels. Syndicates now have unique 3-letter tags which are shown in front of every member’s name to indicate the membership. The internal tax rate can be modified and is shown publicly now. Every syndicate has a level. The experience points for it are collected by their members’ activity. New roles have been added to the syndicates to give different responsibilities to the members of an alliance. An additional column shows the station’s level in the CORETECHS’ list of stations. 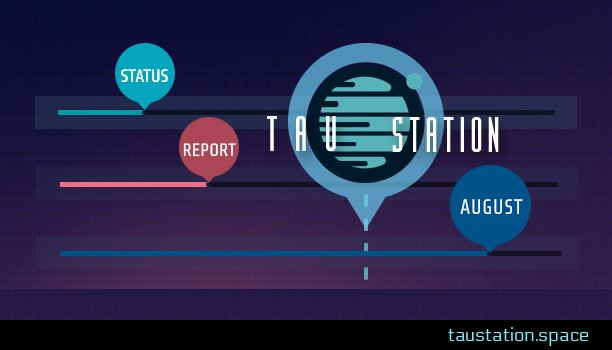 The status reports contain major aspects of the work done on Tau Station each month. As we’ve started to provide changelogs for every game update, you can find way more details, including all smaller changes, in these dedicated posts. Links to all updates/changelogs that happened this month are listed above.